Rubber Room Ramblings: STAMPIN' UP! JUST BELIEVE STAMP SET! This is another card we'll be making at Tuesday Club this month. For this card I used three different Stampin' Up! Stamp Sets: Thoughts and Prayers (for the sentiment), Just Believe (for the flowers) and Watercolor Trio (for the butterfly). 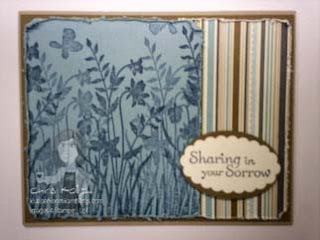 For the colors I used Not Quite Navy ink, Vanilaa, Crumb Cake, Soft Suede and Baja Breeze cardstock. The Designer Series Paper is from the Elegant Soiree Designer Series Paper Pack. The punches are the Stampin' Up! Scallop Oval and Wide Oval. This is a quick and easy card to make, but it has a very elegant look to it. I used my distressing tool to distress the edges and give it a little more texture.